Story: Just like no Hindu ceremony can start without a prayer for lord Ganesha.. no soup recipe is complete without the mention of the "Soup Nazi". You haven't heard of him??? - well then - NO SOUP FOR YOU! My cousin had a baby and his mom came from India to play the typical Indian grandma role.. Within a few months the baby had accumulated numerous toys that made all sorts of sounds. So there was this huge pile of toys in the corner of the living room. Grandma woke up one night and started walking toward the kitchen to get water... Imagine 2.00 am at night - it was really dark and the moment she went close to the toy corner in the living room - She heard a loud deep voice - "Would you like some soup??"..... she was so scared she turned back never got water and started reciting prayers. So - "Would you like some soup?" Boil 3 cups of corn kernels till they are completely cooked. Save 1 cup of corn kernels for later. Drain the water and grind the cooked corn kernels along with the corn flour till they form a fine paste. Heat butter in a soup pan. Add green chilies, carrots, beans, green peppers and half of the french onion to it and saute till everything gets coated with butter. Cover the pan and let the veggies cook on a low-medium heat for about 2 minutes. Once the carrots become tender add the cooked corn mixture and mix well. Cover the pan and cook for another minute. Remove the lid and add the remaining corn kernels. 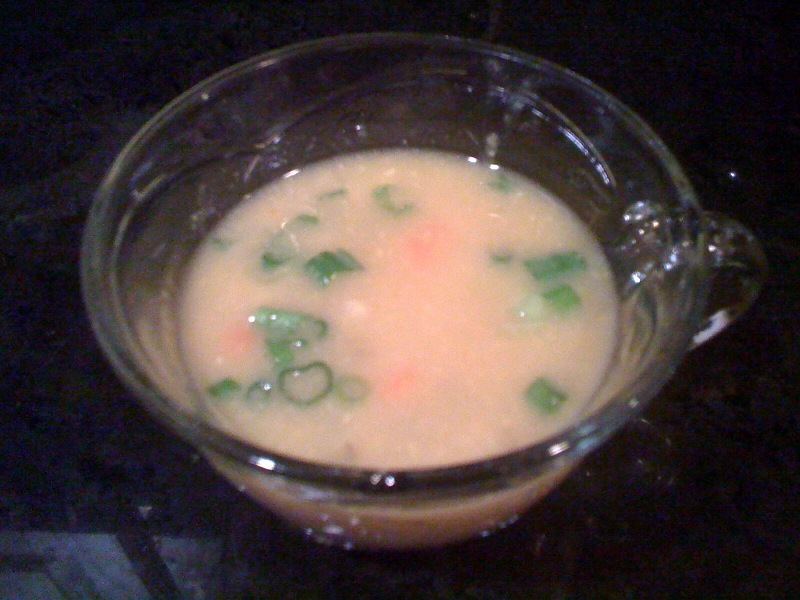 Add water as needed (about 1 cup) to adjust the consistency of the soup. Cover the pan and let this mixture come to a boil. The corn flour in the mixture makes the soup a bit sticky. Once this mixture comes to a boil, add vinegar and mix well. Add salt and pepper as per taste. Add the soy sauce and the remaining french onion just before serving. Serve hot with snacks such as chips and salsa. This one is always a hit! Nice recipe. I think the few times I have tried making my version of this soup, I didn't add full corn kernels. This could make a BIG difference! Will try it soon (sort of). :) thanks Shanu and Ket.. This looks yummy! Can't wait to try it! Thank you MIB! lemme know how it turns out..